Yes, you heard right. 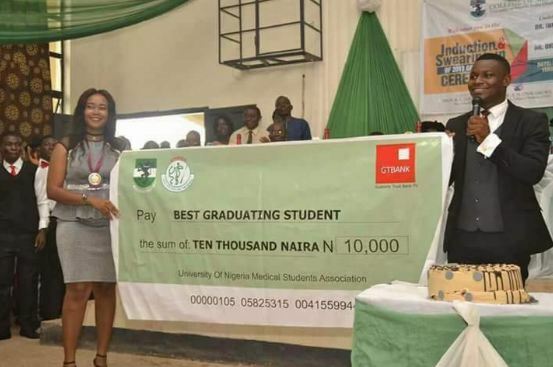 The best graduating medical student in University of Nigeria Nsukka was awarded the meagre and insulting sum of 10,000 naira. Ten thousand naira as in ten k! GTbank, is this the best you can do? Kuku kill me. In a country where TV shows like Big Brother Naija award winners 25 million naira for simply being in a house for weeks, it is quite sad to see the value placed on formal education where a best graduating medical student of a prestigious university as the University of Nigeria Nsukka receives as low a sum as ten thousand naira. To think tonight, one runs babe will smile home with 20,000 naira in her bra. Na wa o!